Let’s talk about dump trucks a bit. And in particular, new and used dump truck financing. Anyway, whenever we finance a dump truck (used or new), I think back to those times in the sandbox and smile. And we’ve been handling a lot of new and used dump truck financing these days. I think one of the reasons companies are leasing dump trucks so much today is partially due the very nature of the vehicle. A dump truck has only one real job – to haul lots of stuff (or mud for my eight-year-old self). 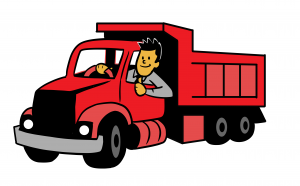 Dirt, gravel, debris, junk, whatever – a dump truck moves it from point A to point B, and dumps it. Where a piece of heavy equipment like a backhoe can have a myriad of uses, a dump truck has one main function. That makes it a little more specialized. And it’s my contention that it’s always best to spread out the payments for a specialized piece of equipment. To expand on that previous thought, a dump truck is very necessary for any construction company. But because it’s so specialized, it’s only used in certain parts of a job. Thus, in an “hours of use vs. price” aspect, a dump truck will take longer to pay for itself than a backhoe will. After my mud-throwing days, a young Fletch worked on a construction site for a bit. The backhoe ran almost daily. The dump truck was used 2-3 times a week (and sometimes sat unused for a week). That’s simply the nature of the vehicle. And this is why new and used dump truck financing makes total sense.